Welcome to our series on Coconut Oil. In this series, we are discussing the health benefits, selection, and uses of coconut oil. Make sure you’ve read our first post in this series: Crazy for Coconuts? There are a couple things to look for when purchasing coconut oil. First, NEVER buy coconut oil (or any other food product for that matter) with the word “hydrogenated” on the label. Hydrogenated oils have been subject to a chemical process that results in the actual chemical structure of the oil being changed—that is, hydrogenated oils have more hydrogen atoms than they are supposed to. By increasing the number of hydrogen atoms you can change the level of “saturation” of the oil—i.e. unsaturated, polyunsaturated, saturated—which affects the consistency and stability of the oil (the more saturated, the less susceptible to degradation/becoming rancid). Therefore, the food industry loves hydrogenation, as it lengthens the shelf life of foods. Plus, it improves the texture of some foods, because hydrogenated oils are thicker and more solid at room temperature. However, the problem occurs when trans fats are created in the process of hydrogenation. Trans fats have been shown to increase the amount of LDL cholesterol (the kind you do not want too high) and decrease HDL cholesterol (the kind you want to be high), thus increasing the risk of heart disease. While there are some natural sources of trans fats, what you want to watch out for are the synthetic ones created in food production. So having eliminated any hydrogenated oils, you will come across the terms “refined” and “unrefined” when it comes to coconut oil. Simply put, refined oil is more processed than unrefined, as it goes through levels of deodorization and bleaching. Refined has a less distinctive coconut taste, and is generally cheaper in price. Unrefined oil is closer to the real plant food, and will contain more of the health benefits of the oil since it is far less processed. It is slightly more “coconutty,” and may be more expensive (but your health is worth the price). Having said that, if you are using the oil for more topical uses or “around the house” (read my next post), refined oil can be a good choice. For ingestion – make it unrefined. Finally, if you can find on the label how the oil was extracted, look for the words “expeller-pressed” or “cold-pressed.” Coconut oil is extracted during a mechanical process that uses pressure to squeeze the oil out of the coconut meat. Cold-pressed is a method that prevents the oil from getting too heated. It is the ideal method since the less heat applied to a food, the more the natural nutrients will remain when it is purchased. Summary: The best coconut oil for eating would be unrefined, organic, raw, and cold-pressed. I am particularly a fan of the brand of coconut oil available at Trader Joe’s, and they also have a coconut oil spray that is much healthier to use than traditional cooking sprays. For coconut oil product reviews, visit Evolving Wellness’ article comparing best and worst brands. 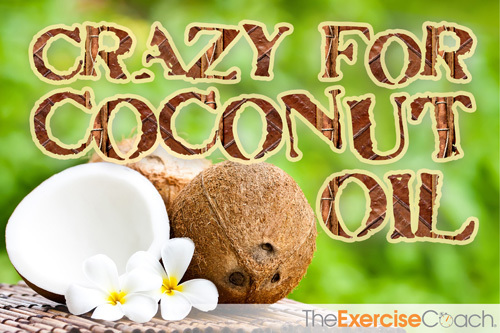 Coconut oil, which is 92% saturated fat, is already a stable fat. That is, it has a chemical structure that can stand up to higher temperatures than oils that have fewer saturated fats. It is best stored in a cool, dry place. At room temperature, it will store as a solid. In warmer temperatures (summer months, heated kitchen, etc. ), it will store as a liquid, as it melts extremely easily. You can leave it out on the counter at room temperature for up to two years. However, many people prefer to refrigerate for optimal freshness. Coconut oil can be used in place of any other cooking oil that you currently use (1:1). In fact, because of its saturated fat content, coconut oil is safer to use at high temperatures than other oils. It is even preferable to use it over olive oil in cooking, as olive oil contains mostly monounsaturated fats, and can become rancid more easily. (It is best to use olive oil on cold dishes such as salads or drizzled on foods after they are cooked). I use coconut oil when sautéing onions, roasting vegetables, frying eggs, browning meat—I basically use it for all cooking needs. My favorite is scrambled eggs cooked in a bath of coconut oil—they are extra fluffy and delicious! It does add a slight coconut flavor to dishes, which I do not mind. But, even if you’re not a “coconut person,” you probably wouldn’t even notice it in most dishes. You can also add coconut oil to hot tea or coffee instead of those artificial creamers, or even take a spoonful to soothe a raspy throat. Below are two of my favorite recipes that I like to make. 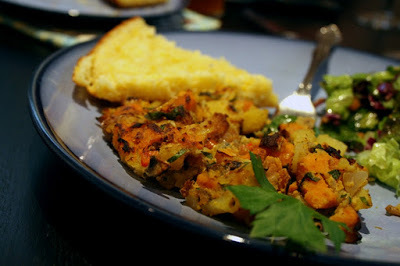 One is a curried sweet potato hash, inspired by cookbook author Sarah Fragoso, and the other is a creation all of my own, reserved for an occasional treat. Heat the coconut oil in a skillet. Mix the first 7 ingredients in a bowl, then pour into skillet and cook until potatoes are cooked (shouldn’t take too long with grated sweet potatoes). I love eating this in a bowl with a fried egg on top (cooked in coconut oil of course). The yolk oozes over the hash and creates a delightful and delicious eating experience. Yum! Mix the coconut oil, coconut, vanilla, and salt in a bowl. Let harden in the fridge. Scoop out small rounds of the mixture, then, dip in melted dark chocolate. Place on parchment paper to cool and put back in fridge (or freezer if you want them fast!). You can play around with this one, sprinkling some chopped pecans or walnuts on the top before they cool, or mixing in other ingredients (i.e. 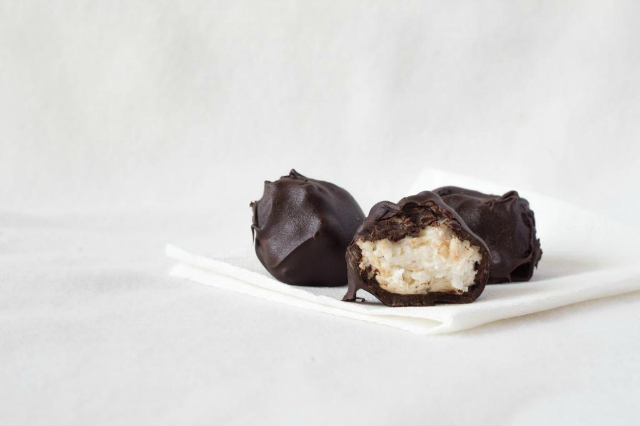 almond butter, mashed banana — Heck, dip anything in dark chocolate and it’s going to be really good!) Enjoy!